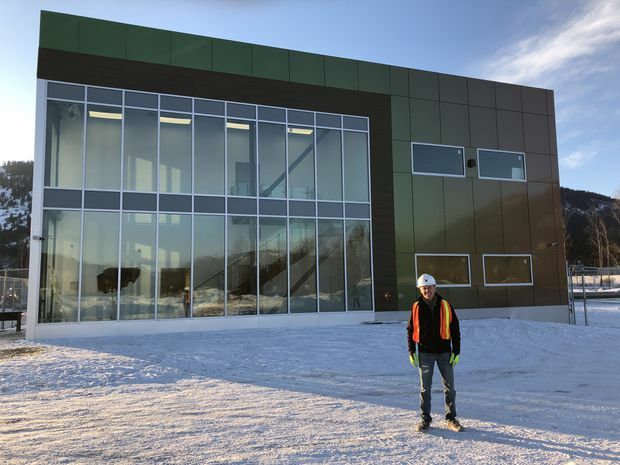 True Leaf founder and CEO Darcy Bomford stands in front of the first building constructed on the company's nascent campus in Lumby, B.C. 'We want to be in a prime position once we get licensed, Mr. Bomford says. The first new structure on the True Leaf Campus is a grassy shade of green when viewed head-on. Walk a few paces to the left or right, however, and its aluminum cladding turns to a mossy brown, or a darker green, or another cannabis-related hue. The facade’s shifting colours are eye-catching and industry-appropriate, to be sure, but they also present an apt metaphor for an industry. With Health Canada regulations and licensing on cannabis still in flux, a shortage of viable leased space in British Columbia’s Okanagan, long one of the country’s top cannabis-producing regions, is prompting ventures to spend investment capital on new and refitted buildings that must account for the industry’s still-uncertain future. True Leaf Medicine International Ltd. is a case in point. As founder and chief executive officer Darcy Bomford explains during a tour of the nascent campus, the six-year-old company’s two subsidiaries, True Leaf Medicine Inc. and True Leaf Pet Inc., initially sought to lease commercial space for the hydroponic cultivation of cannabis and production of therapeutic goods for people and household pets. It was a different story in nearby Lumby. Mere months after the 2017 Vernon application was rejected, True Leaf received local and federal approval to build its facility in the logging community of 1,700 people, most of whom are “very excited about seeing some growth in Lumby and having some diversity in industry coming to town,” according to Mayor Kevin Acton. With $6.18-million raised through a public offering of shares, True Leaf spent about half of it on 16 hectares of industrial land just south of Lumby’s main intersection. The plan at the time was to refit an existing 16,000-square-foot warehouse on the property and then rapidly expand operations once Health Canada licensing came through. The eventual goal: a one-million-square-foot facility producing more than 125 tonnes of medical-grade cannabis a year. Slated to open soon, the two-storey, 18,000-square-foot hub of the True Leaf Campus will house two small grow rooms with a drying and packaging area, as well as space for a vault, processing, testing, security and staffing on the ground floor. Further amendments to the company’s Health Canada application will allow for testing, research, office and call-centre space on the second floor. True Leaf’s steps are being echoed across the region. 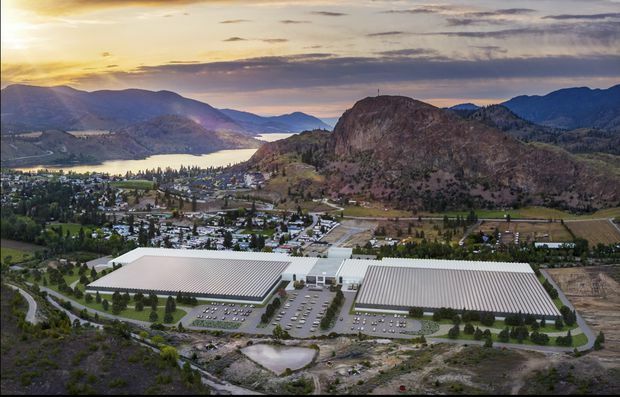 After announcing plans for a 740,000-square-foot Sunniva Canada Campus on a former sawmill site in Okanagan Falls, the Vancouver-based company ultimately embraced what it calls “a smaller modular phased approach” aimed at “accelerating our licensing and production timelines.” Should the campus end up reaching its intended size, Sunniva says it will produce 25 tonnes of medical-grade cannabis a year. Then there’s Doja Cannabis, which purchased a 22,580-square-foot industrial building along Highway 97 after its 7,000-square-foot grow facility in West Kelowna successfully completed Health Canada’s presales licence inspection. The new building is now being refitted to produce five tonnes of cannabis annually. These new builds and refits come as no surprise to Eric Weber, the associate vice-president of real estate service Colliers in Kelowna. With the region’s sub-2-per-cent industrial vacancy rates among the lowest in Canada, “the odds of finding a leased space that ticks all your boxes is extremely remote,” he says, pointing out that cannabis ventures must comply with strict electrical and security standards set by Health Canada, and typically require features such as 20-foot ceilings and dock doors. As Mr. Bomford and Mr. Weber both point out, the shortage of cannabis-friendly vacancies is also due to the prevalence of B.C. Agriculture Land Commission reserve holdings in the warm, sunny, hilly region that has long been filled with orchards, vineyards, and yes, illicit cannabis growers who are now seeking to profit legally. On one hand, Mr. Weber says, “the Agricultural Land Commission will tell you that their job is to protect farmland, not to help cities or companies expand.” And while some municipalities are open to cannabis ventures setting up shop on agriculture reserve land, “the commission says you can’t have a cement floor, and for medical-grade grows you need a cement floor,” Mr. Bomford explains. With smaller communities such as Lumby and Okanagan Falls jumping at the chance to rezone defunct industrial sites, larger municipalities are playing catch-up. Kelowna, for instance, recently identified several hundred zoned sites for cannabis-related commerce. “When they wrote the zoning bylaws, no one contemplated cannabis cultivation as a permanent use,” Mr. Weber says. A rendering of the Sunniva Canada Campus, which the company says will produce 25 tonnes of medical-grade cannabis a year.